My son is coming home from college for the first time since he left. I'm so excited. 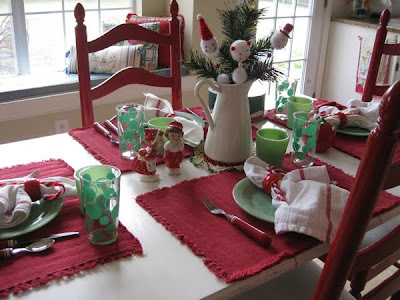 This is our usual Christmas breakfast table, but I thought I'd do it tonight in honor of Son. Here's my newly painted table and chairs, just in the nick of time for Christmas cheeriness. I used my vintage jadite and vintage polka dot glasses. Cute dutch salt and peppers. 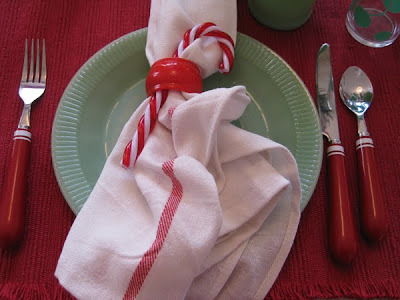 I used dishtowels for napkins and my old Target flatware. Here is my vintage small cake plate-it looks really good with the jadite and kind of ties the red and green together. I'll stick some homemade brownies in there for dessert. We will have natchoes for dinner because Mexican food is what Son missed the most. Welcome Home! I'm joining It's a Very Cherry World and Between Naps on the Porch today. 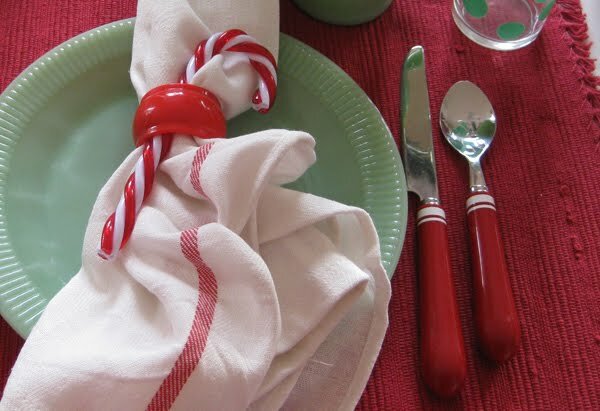 Please go and check out some wonderful reds and beautiful Tablescapes! That is such a pretty tablescape. I love the pairing of the red and the greens together. And the cake cover is so unusual. I have never seen another like it. I know you will so glad to have your Son home for the holidays. 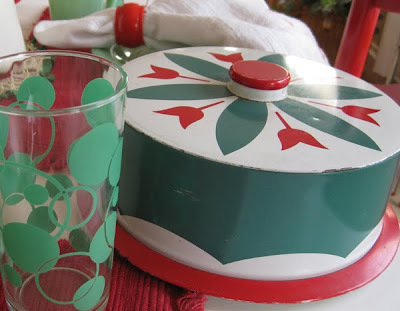 I am in love with everything...especially the polka dot glassware...charming. I collect Fireking polka dot bowls which I use to decorate with. Love everything!! What a wonderful table! I am still lovin' that table and chairs redo! Everything looks so cheery! Yeah for his return!! yeah for Leslies smile..I can feel it thru your writing..lol Have a great week!! How wonderful for all of you with "Son" coming home. I remember those days. I usually had everything ready for Christmas by the time they arrived so we would just focus on family things. Have a wonderful time with your son and thanks for the visit. How exciting!! I literally hung up the phone with my son before clicking on your blog entry, he will be home next Friday. I know the feeling your experiencing all the well. I don't think it will ever go away. Your tablesetting is awesome!!! I love everything about it but, but, the covered cake plate....might need to come and live with me!!!! Happy Homecoming and Happy Rednesday, Leslie!! How sweet... It's good to have the family gathered round, isn't it? Love your pretty table. Thanks for stopping by my blog. Couldn't find a post with the window frame you mentioned. Would love to see your take on this new piece to my collection; could use some ideas! 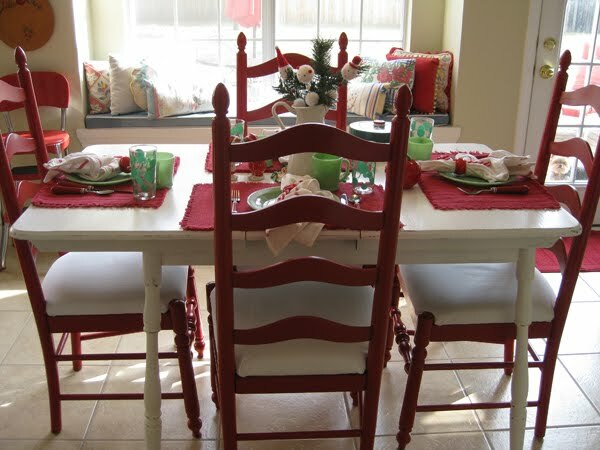 Wow, your tablescape looks great with the newly painted red chairs! What a fabulous cake plate and cover! Enjoy having your son home for the holiday break! What a great table setting--I love your vintage cake plate! Your table and chair re-do looks awesome with the items you've set on it. I especially love the jadite. Happy Homecoming! Oh, thanks so much for stopping by and saying hello! Your table is so pretty. I remember my Grandma J. having those very same coffee cups as we were growing up. such a pretty tabel for him to come home to. Love those vintage glasses. 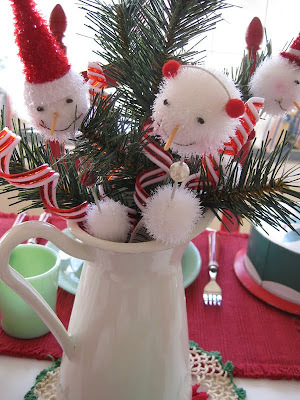 Very cute and colorful Christmasy table. Warm and inviting!! Breakfast will be such fun!! Blessings and glad you have your son home, I know you will enjoy that!! I am loving this tablescape. The table and chairs look so totally different and cute now that you painted them. Looks great for Christmas! Your table is so cute! Love all the vintage elements, especially the cake plate (which I've never seen one like). Also, I like your window seat w/ red pillows and the red chairs. I know you will enjoy your time with your son. I'm not looking forward to my oldest going to college, but thankfully, I have a few more years. Not only the cake with the crystal looking plate to go with it, but an amazing vintage hand beaded purse (looked brand new), beautiful outdoor plastic dishes (a whole set of 6,,,pretty much brand new)....I'm trying to think what else I took from that person's boulevard ,,lol...My girlfriend laughed at me..I screamed..'stop''..and threw open the door before she even stopped. 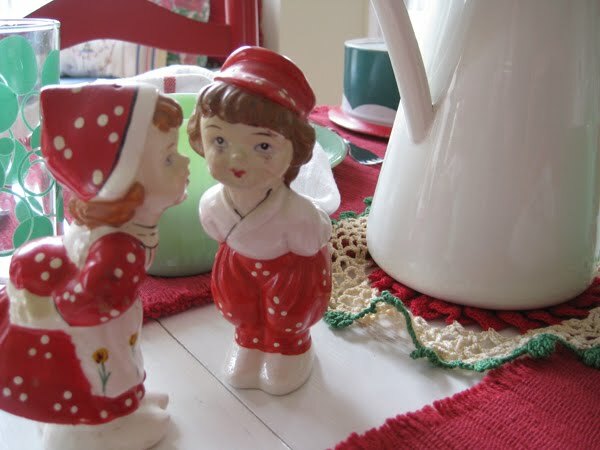 I love your red and white table and chairs. So cheery and will be fun year round. How great that your son is coming home. This will be the perfect table to gather around. 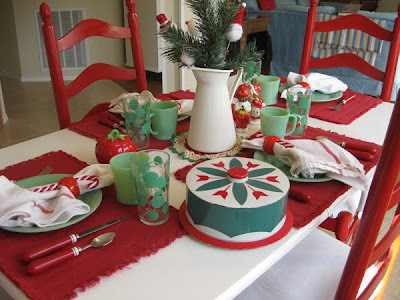 lovely festive table, the cake plate is wonderful! It is very pretty, and I can't wait until my son comes home- tomorrow actually for Xmas vac. from college! Celebration. Love your color combinations. Your jadeite is a wonderful collection. Loved the cake plate! I love your vintage red and green table. 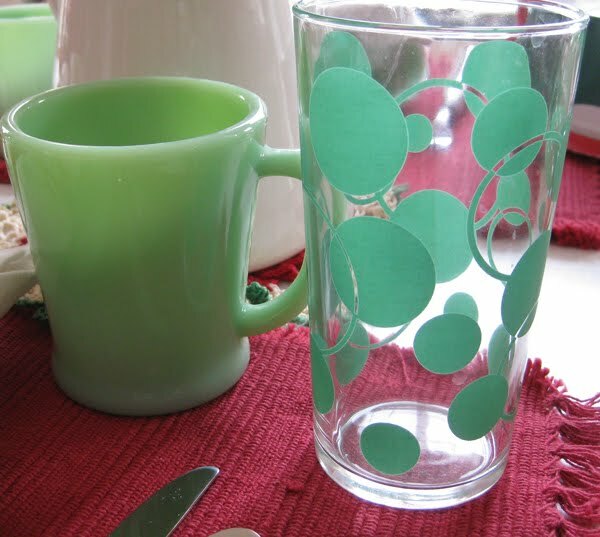 I remember my mother had a whole set of the jadite and polka dotted glasses when I was a teen. What a great cake saver! Such a festive table! BJ must find college dining rather dull after growing up with such a creative mom. I think I'll go get out my Christmas dishes right now before I forget!! See you at Curves (or Kroger)!!! Welcome home to your son ! That is a marvelous Tablescape .Merry Christmas ! I'm picturing myself at your kitchen table.